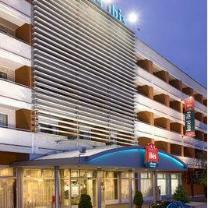 3-star-hotel in the 9th district of Budapest. Address: 1091 Budapest, Ferde u. 1-3. The hotel has 139 rooms. Set on a tree-lined street, this classic hotel with a modern, streamlined exterior is a 4-minute walk from a metro stop and 10 km from the iconic Buda Castle, and it is very close to the airport. Casual rooms, with simple wood decor and vibrant tones, feature free Wi-Fi, flat-screen TVs and balconies. A sleek 24-hour bar serves drinks and snacks, and there's also a garden terrace. Other amenities include a business center, a kids' play area and on-site parking (fee).